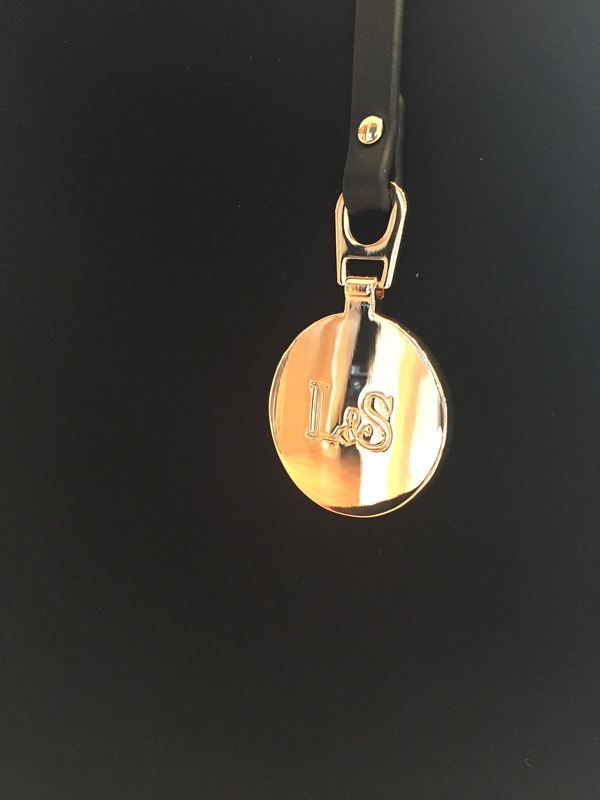 Lo & Sons is a brand that gets a lot of attention on blogs and other social media. I was intrigued by their Catalina Weekender bags after seeing a few of my favorite bloggers write about how much they held, and I bought blue one about a year and a half ago. After using the Catalina for a few trips – including a complicated carry-on only jaunt that took me from a work trip in Dubai to running a race in Florida – I can attest to the fact that it holds a lot. Too much, in fact. That trip I mentioned above gave me permanent shoulder grooves from hauling a heavy, overstuffed bag across 30,000 miles. 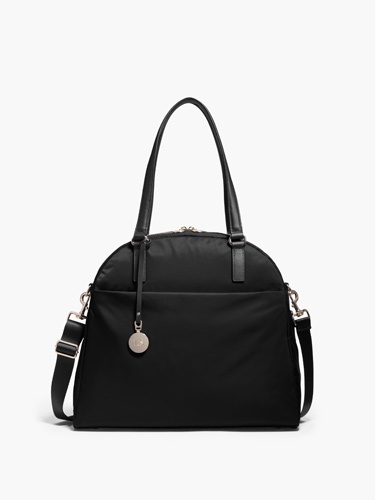 (Now there is a Deluxe Catalina available in two sizes that seems more travel friendly; there’s a sturdy crossbody messenger strap and a back sleeve to slide the bag on top of an extended luggage handle for easier transport). But sometimes the Catalina is still more than I need. The O.G. 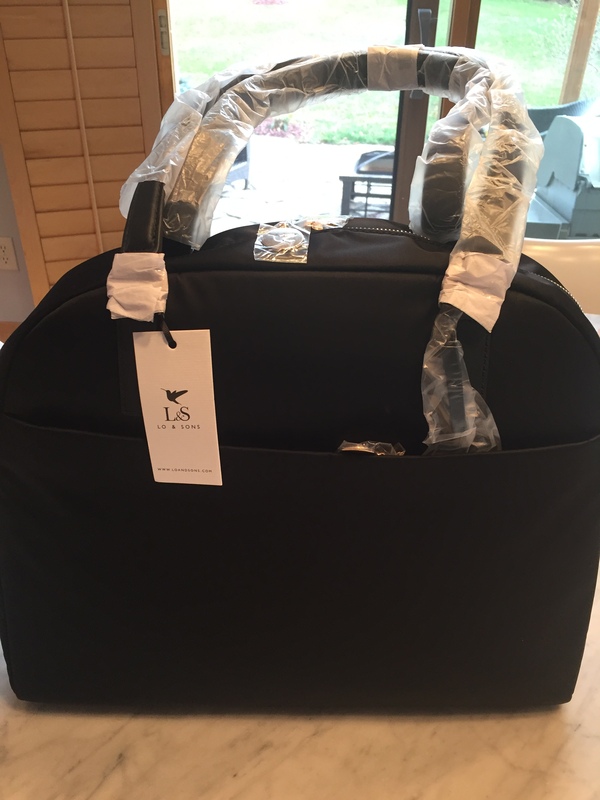 (“overnight and gym”) bag is described as a lightweight overnight travel bag. Honestly, the O.G. is better looking than the Catalina. It would be perfect to bring on a short work trip that involved traveling with your boss. In contrast, the Catalina is better for a beach weekend with friends. The O.G. also comes in two sizes: original and medium (cutely named the “O.M.G.”). When I found a sale on the O.G., I bit. 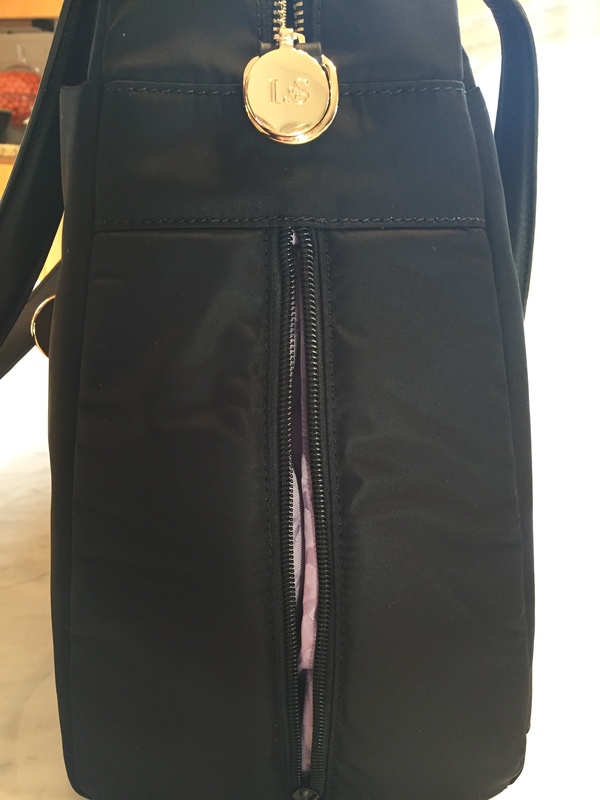 I selected a black bag with lavender interior and gold hardware. The bag arrived in only a few days. It was packaged extremely well. Every zipper, tag and strap was wrapped in packaging material. There are metal footings on the bottom. I love when bags have this feature. The decorative “L&S” tag on the front is a nice touch. 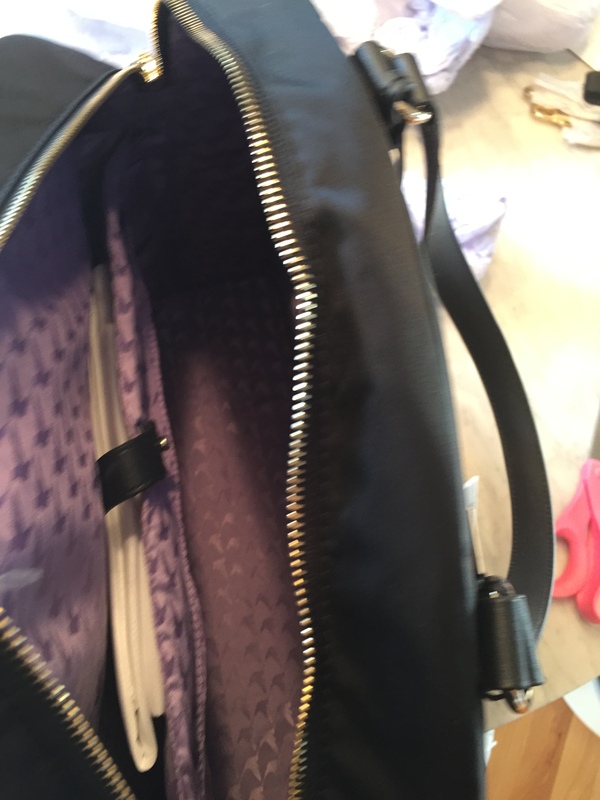 Ok, the above image is blurry and I have mentioned many times that I am terrible photographer, but what I was trying to show is the padded laptop sleeve, the lovely lavender interior and the folded white item in the laptop compartment is a dustbag. You know you’ve got something nice when there is a dustbag. Here is the shoe compartment on the side. 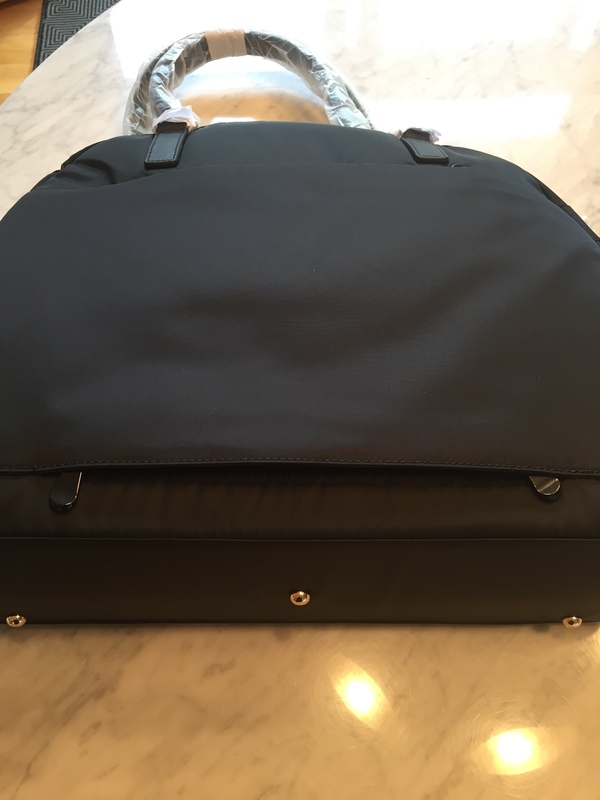 This is clever: on the inside of the bag’s main compartment, the rest of the shoe bag (entry only shown here) can be rolled up and snapped into place when not in use so as to not take up space in the main compartment with an empty, floppy shoe bag. When needed, it can be unsnapped on the inside and shoes placed in it from the outer entry shown above. 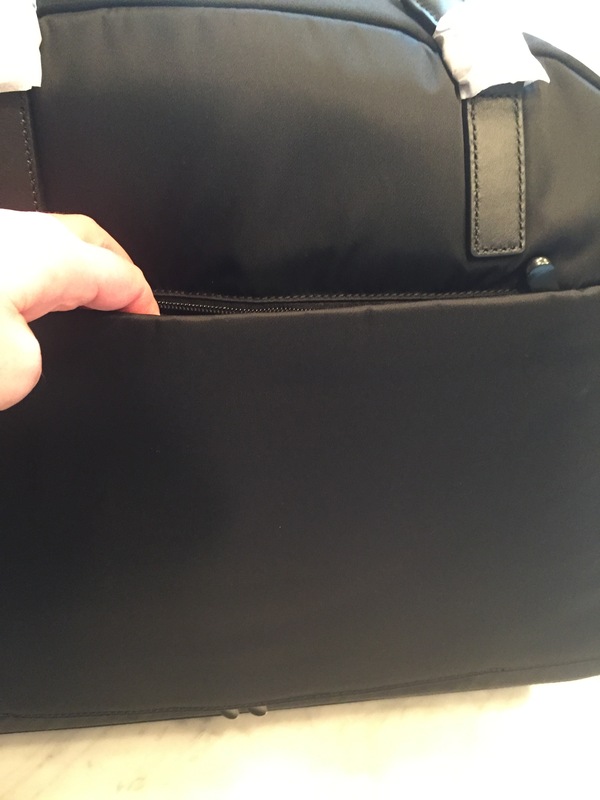 On the back of the bag, there is a doubly zippered compartment spanning the bag’s width. There are zippers on the top and the bottom. When it’s opened all the way, this is an open sleeve to slide over the extended handle of a wheeled carry-on. If just the top is open, it is an exterior pocket that is big enough to hold a magazine, books, etc. The top compartment can also be zippered for extra security. I thought this design element was an especially nice touch. I’m about to embark on a lot of work-related traveling, especially with carrying a laptop back and forth, so I am excited to see what this bag can do. P.S. You may need to watch carefully, but Lo & Sons often runs sales on their bags, especially around holidays. If you are not picky about color, you can get the O.G. right now for 30% off in red or blue, or 20% off for black, gray or olive. P.P.S. 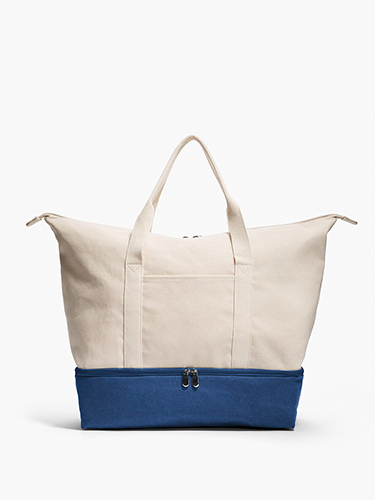 The Catalina bags are on sale, too.